I'm planning a trip in which we'll rent a car in LA in late January, 2014, we will then go north and then to South Lake Tahoe. After a few days of skiing we plan to go down to Las Vegas. Will I need snow chains in my car to do this last leg of the trip? All the rental car companies that I've seen doesn't allow snow chains to be installed in their cars. If the snow chains are needed and I don't have them how much time can we be held in Tahoe because of this? You might want to read up on the Donner Party and make up your own mind. 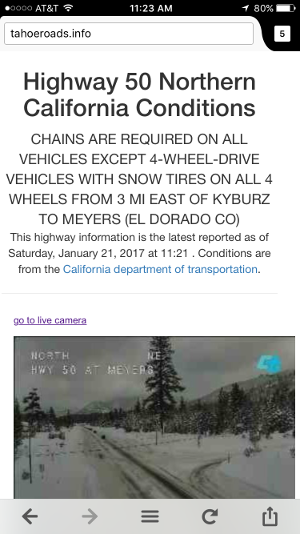 While you're unlikely to spend four months trapped in the snow eating your dead, it would seem prudent to carry chains in the middle of winter in the Sierra Nevada (which means "snowy range / mountains in Spanish). I'd rather be mobile with chains than stuck because a rental company told me I couldn't have them. It's always easier to get forgiven than it is to get permission and if you damage the car in the process, well, that's what they make insurance for. Some tire companies will sell you chains during the winter, and if you never use them, allow you to return them after winter is over. Not sure if that happens in CA, but it's true up here in WA. Effectively you can "rent" chains for several months and if they're never used, simply return them. If you get a chance, take the drive down to Kirkwood, awesome skiing there, and the crowds aren't so bad. It's my favorite ski area in Tahoe. It is very possible that you will need chains. In both California and Nevada, the state may impose "chain controls" when necessary, meaning that it is mandatory to use tire chains in the affected area. Typically this would only be during a snowstorm, and the control would be lifted when the snow stops and the roads are plowed. This would be most likely to affect the mountain passes surrounding Lake Tahoe, and possibly South Lake Tahoe itself and the vicinity. Here is more info from Caltrans and Nevada DOT. In this case, it would be your decision whether to use chains in violation of your rental agreement, or to wait out the storm wherever you are. The Sierra Nevadas get a lot of snow and in principle a snowstorm could last several days. On a similar note, you should definitely check on weather and road conditions before and during your trip. Some of the mountain highways in the Sierras are closed all winter. You may need chains, it depends on the road conditions. tahoeroads.info says whether chains are currently required in South Lake Tahoe (highway 50) and is updated in realtime. I used to work at a rental yard in Ventura, California; 120+ miles away from the nearest snow; and we rented plenty of snow chains each winter. We included with each rental a bungee-type strap to hold the chains tight against the tire to prevent vehicle damage. Number one question from people renting: Do we get a discount if not needed? Answer. No; consider it insurance. Not the answer you're looking for? Browse other questions tagged usa safety car-rentals snow nevada or ask your own question.